Our Import and Export Departments are staffed with experts in both Air and Ocean Logistics. We use cutting-edge warehouse management systems for precision and efficiency in logistics. Our experience in shipping allows us to specialize in a number of areas in the industry. 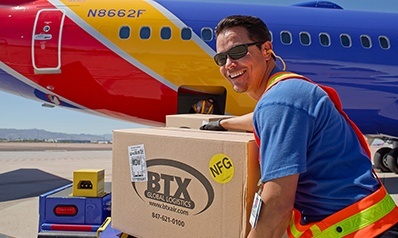 BTX Global Logistics was formerly called BTX Air Express. BTX Global Logistics utilizes the world’s leading airlines to provide you with the most value in airfreight service options. From express shipping to more cost-effective services like economy class, BTX is positioned to offer our customers the flexible and cost-effective solutions you require. When “next day” isn’t fast enough, BTX will get your package on the next flight out to its destination. Overnight delivery to over 20,000 communities in the U.S. Service available weekends and holidays, 365 days a year. No weight or size restrictions. Door-to-Door delivery within two days to every zip code in America. Packages of any size, shape or weight shipped and delivered on time. Upgrade from ground services and cut costs from 2nd Day service. Perfect for distributing large volumes of parcels nationwide. Time definite Door-to-Door delivery at the lowest possible rate, with scheduled arrival times anywhere in North America. Rates competitive with major truck lines.